Leviticus 23:23-25, Numbers 10: 9-10, 29:1; Neh.8:1-12. Rosh Hashanah is surrounded by a 40 day season of repentance known as Elul. During this time the religious leaders often read to the people from Psalm 27 and Ezekiel 33. (3) Rosh Hashanah is the beginning of what is known as the 10 Days of Awe. It is a time when we are judged by God for our past year's behavior. Rosh Hashanah has many characteristics. One is that it begins the religious cycle on the calendar, therefore, it is recognized as the first month. (This works similar to July 1 being the new fiscal year for many corporations). The seventh month also began an agricultural cycle. (1) It is also associated with judgment day. One reason may be that Joel Chapter 2 speaks of trumpet blowing in connection with great judgment. (1) Some refer to this day as the Jewish New Years first day. Greeting cards are sent similar to Happy New Year cards for those who observe the Gregorian calendar. This holiday begins a cycle of holidays, including the 10 Days of Awe, Yom Kippur (Day Of Atonement), and Sukkot (Feast of Tabernacles). One of the themes of Rosh Hashanah is to declare Gods kingship. He is our king, and we are His subjects. One of the greatest ways we can recognize God's kingship, is to freely, willingly, and understandably choose to serve Him. Sometimes it may seem easy to proclaim God as king of the universe, but hard to proclaim Him as king over our individual lives. Other themes include God's remembrance of His people and the sounding of the shofar each day. (Rosh Hashana is usually celebrated as a two day holiday). The Feast of Trumpets is considered a solemn assembly. The trumpets were blown as a sign of preparation for the coming Day of Atonement. The belief that God has our names written down in a book comes from Old Testaments scriptures like Exo. 32:32-33 and Psa. 69:28 and is supported again in the New Testament in Philippians 4:3 and 7 times in the Book of Revelation (Rev. 3:5; 13:8; 17:8; 20:12; 20:15; 21:27; 22:19). The appropriate greeting in Hebrew is L'Shanah Tovah Tikatevu which means may your year be good and sweet, or may you be inscribed (in the Book of Life) for a good year. The first day of the month of Tishri is considered a Sabbath (Rosh Hashanah) Lev. 23:23-25. Passover, Yom Kippur, and the Feast of Tabernacles also have declared days of rest as part of their observance. Some rabbinical commentaries state that Adam and Eve were created on this day (Sanhedrin 38b). Some believe that Adam sinned and was forgiven on Rosh Hashanah (Vayikra Rabba 29:1). It is also believed that Abraham and Jacob were born on this day. Both of these men brought a chance for a new beginning. Tradition also has it that Jacob was freed from prison in Egypt after 12 years of incarceration on this holiday. There is a tradition that the sacrifice of Isaac occurred on Rosh Hashanah (Tanchuma, Vayero 22:13). For more information on culture and tradition please visit The Temple Institute. Theses area's of scripture are common readings in many congregations during the holiday. Gen. 21, 22, Jer. 31:2-20, Num. 29 1-6. 1 Sam. 1:1-2:10. (Samuel is believed to have been born on Rosh Hashanah). There is another custom known as Tashlich. This custom probably gets it's name from a verse found in Micah, He will again have compassion on us; He will tread our iniquities under foot. Yes, You will cast all their sins Into the depths of the sea (Mica 7:19). On the first afternoon of Rosh Hashanah following the prayer service, it is customary to go to a body of water (creek, lake, river etc.). If possible, the water should contain fish. Fish were the first witnesses of God's creation, which tradition states began on Rosh hashanah. (7) The fish are symbolic for representing God's eyes which are always open similar to the eyes of a fish. Take some bread crumbs with you and toss them into the water. These crumbs represent our sins and our evil desires to do them. There are also special prayers said at this time, including a prayer for God to dismiss our sins on the Day of Judgment. Mica 7:18-20 is also recited. The custom of Tashlich is believed to have started in medieval times, possible in Ashkenazic communities. Tashlich is translated as "You shall cast". Some claim that in the 14th century, Jewish people were seen doing this and accused of poisoning the wells of Europe. Later they were blamed for causing the Black Death (bubonic plague). Shofar comes from a root word meaning hollow in Hebrew. The ram's horn used as a shofar is hollow. There are different sounds that can be made with this musical instrument. When Blowing The Shofar, the rest of the congregation should be quiet so that they can appreciate the unique sound that only the rams horn can make. Some believe the different sounds represent the different themes of the holiday, such as sovereignty and remembrance. When blowing the shofar, some congregations follow a specific order of the different sounds the shofar makes. Some prayer books call for the shofar to blown 30 times. The shofar was used in the past for gathering the troops at wartime and sounding a victory. When we hear it today, it is a call to repentance, a wake up call. Many believe that this is the trumpet sound spoken of in the Bible when the Messiah comes. The shofar sounded when Israel was given the Torah (Exodus 19:19). The shofar sounded when the walls of Jericho came tumbling down (Joshua 6:20). The shofar will sound when the Lord Himself blows the shofar (Zech. 9:14). There are Ten Things That The Shofar Is Symbolic For. It is usually forbidden to blow the shofar on the Sabbath. During the second temple days, the blowing of the shofar was allowed inside of the temple on the sabbath but not outside of the temple. Some Jewish commentaries state that it is the sound of the shofar encourages God's mercy (Leviticus Rabbah 29:4). The Talmud teaches that blowing the shofar is a way to proclaim God as King. Rosh Hashana is considered a day to enjoy a great meal. This custom comes from Neh. 8:10. The food for Rosh Hashanah is perfect for anyone with a sweet tooth, because the custom is to serve nothing sour or bitter. The hope is that sweetness will last for the whole year. The Honey Cake is a traditional Rosh Hashanah treat. Eating this food at this time of year is based on King David's actions in 2 Sam. 6:15-19. The custom of blowing the Shofar is the unique ritual associated with this holiday. Even so, people were still used to hearing the Shofar because it was blown every Sabbath when it was time for the additional (Musaf) offering (Num 10:10). The 10 Days of Awe begins on Rosh Hashanah and ends on Yom Kippur (Day of Atonement). When Ezra met with the Jews of Jerusalem in 458 B.C. on the day of Rosh Hashanah, he ordered them to celebrate the festival by giving charity to the poor (Neh. 8:9). This holiday is considered by most Jewish people to be the second most important holiday of the year, right behind Yom Kippur. Sometimes special cantors are brought in to change the melody of some prayers to sound mournful. 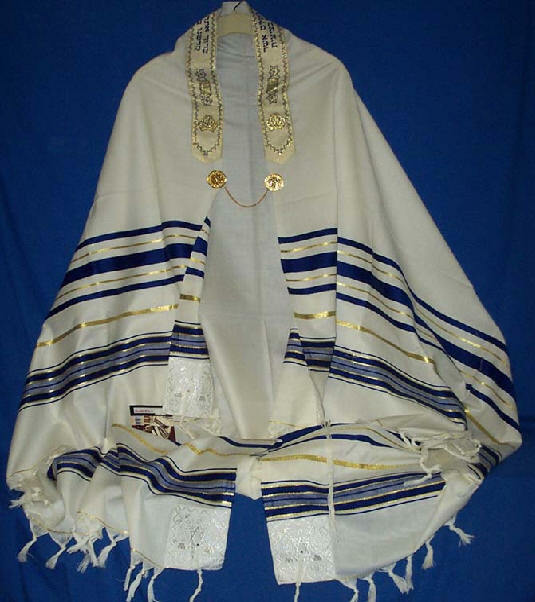 There is a tradition to cover one's head with a Tallit (prayer shawl) at parts of the service. Rosh Hashanah is considered to be a judgment day. Believers in Jesus can know they are written in the Book of Life. They do not have to go through nine additional days of Awe to get to a Day of Atonement. Every day is a Day of Atonement because every day Jesus represents us as our high priest. The holiday is a time of new spiritual beginning. Believers in Jesus are also new creations (2 Corinthians 5:17). Some believe that because there is the sound of a trumpet (1 Thess. 4:16-18 and Rev.19), that the event known as The Rapture which is part of Living In The End Times may occur on this day. They believe that in the same way the shofar sound calls for an assembly to prepare for the Day of Atonement, a shofar sound will also call for an assembly of all believers, dead and alive, in the heavens with Christ. Isaiah 27:13 also predicts the sound of a trumpet. No man really knows when this will be, but since Messiah has to come back on one day some time in the future, then it's possible Rosh Hashanah is that day. 1 Corinthians 15:51-52 also describes a trumpet being sounded with the return of our Messiah. Interestingly, some Rabbis connect the shofar being blown with the raising of the dead. Some people believe that because God blessed their ancestors Abraham and Isaac, that God will bless them. They call on God in prayer to remember Abraham's righteousness and ask to receive mercy based on what he had done and not themselves. This is very similar to believers in Jesus praying to God to count on the righteousness of Christ, instead of themselves. In both instances, God is petitioned through prayer to let someone else's works speak for them. Christians know that there is no need to wait until a certain time or date to pray for forgiveness. A Christian is encouraged to ask for forgiveness as soon as they are aware of their sin. It is a daily opportunity and obligation. Read one way that Paul uses the trumpet in scripture in The Sound Of The Trumpet. This is a very short interesting read. It is a custom to eat slices of apple dipped in honey to symbolize a sweet new year. Why not have a snack with a Jewish friend. The prophet Nehemiah observed this holiday without the focus being on repentance and judgment (Neh. 8:10). The first of Tishri is not called "Rosh Hashana" or the "new year" in the Old Testament. There is some reference to the "new year" in Ezekiel 40:1. 1). Messiah Magazine #87, published by First Fruits of Zion. 3). Jewish Voice Today. September/October 2009 p.12. 4). The Feast of Israel,by Bruce Scott of Friends of Israel Ministries. 5). The Fall Feasts of Israel, by Mitch and Zhava Galser. 6). Chabad of Peoria Jewish Art Calendar 5768 (2007). 7). Messianic Times Feb. 2007 (Lisa Berenson). 9). Chosen People Ministries,September 2008 Newsletter. 14). Rabbi Chaim Richman (The Temple Institute) www.templeinstitute.org.